Excuse me if I have chosen excessive images for this pary. But this Studio 54 disco party looked so much fun, and so much full of love, I just couldnt help it! I’m totally having a party like this for my next milestone birthday – my music, awesome outfit, fitted out like a nightclub, and my family and friends dancing all night! Decinda from Sugar & Spice Events, who did all the styling, outlines it all below. The colour scheme for the party was silver, gold, pink and purple. The Studio 54 disco party was held at the Palazzo Versace. The whole room was decked out like the legendary nightclub. Guests had a taste of the theme before they entered the room, with an incredible disco inspired balloon photo wall. Metallic silver balloons with disco balls, stars and moons created a magical wall for guests to pose in with. Illuminated cubes and huge balloons with silver tassels took the place of daggy photo both props, and moving lights added to the theatre of this space. Enveloped in colour, the room was lit in hot pink, blue and purple, with movers projecting onto the stage and dance floor. 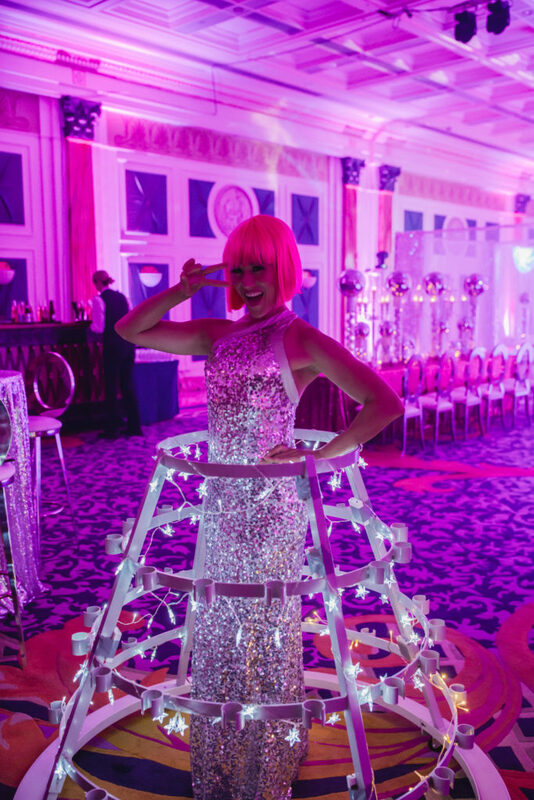 A stunning model served champagne from her ballgown and welcomed guests into the room. Using fabulous fringed curtains, we created chill-out booths with ottomans, shaggy rugs and sequinned cushions. These areas were perfect for guests to rest their dancing feet but still see all the action. Cocktail tables glimmered in silver sequins, and disco balls were EVERYWHERE! We piled them into vases, onto tables and between shiny white candelabras. They reflected the light around the room to add even more sparkle. The incredible cake was literally a hanging disco ball! Illuminated furniture created cluster seating areas and these glowed in hues of pink and purple. A truss arch with disco balls and a huge Studio 54 sign was built over a white stage, and huge light up letters screamed DISCO! An incredible light up dance floor was placed in front, and guests needed no encouragement to get on it. I love how the guests got dressed for the part!